The Central District of California is the largest Bankruptcy Court in the United States. 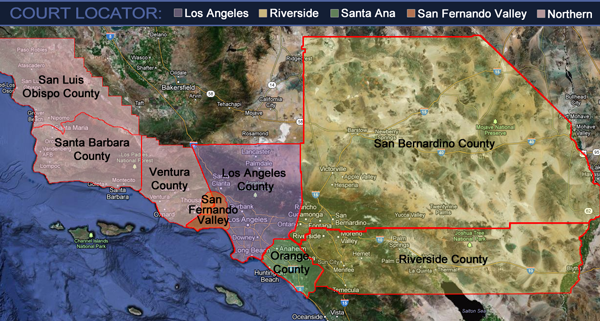 Presently, the District holds court in Los Angeles, Riverside, Santa Ana, Santa Barbara, and the San Fernando Valley. The Central District is part of the Ninth Circuit, which encompasses the federal courts of nine states: Alaska, Arizona, California, Hawaii, Idaho, Montana, Nevada, Oregon, and Washington. The Ninth Circuit also extends appellate services to the Territory of Guam and to the Commonwealth of the Northern Mariana Islands. The Ninth Circuit is the largest of the twelve federal circuits in size, population, number of federal judges, and volume of litigation. It includes fifteen federal district courts, thirteen bankruptcy courts, and a court of appeals.